We're working our way through all 77 race/class combinations in the Pathfinder Roleplaying Game Core Rulebook. We're showing off the Halfling Cleric and Druid today. If you've missed any previous entries you can catch up HERE! Now, let's take a look at this weeks' halflings! 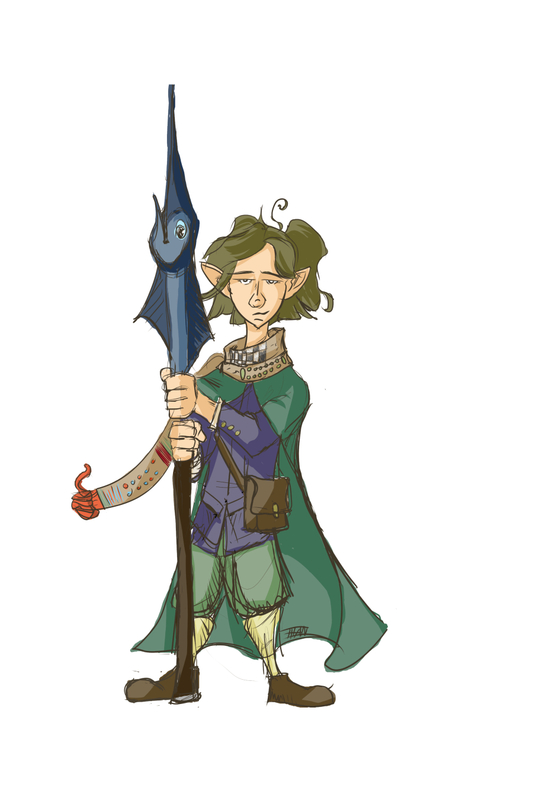 First up is the Halfling Cleric. Halflings in Chronicle are known as Caun. They are a wandering race, travelling from city to kingdom. Caun are favored by Jul, goddess of creativity and travel. It is said that she delights in their stories and so a worship of Jul involves the telling of stories around a fire and offering sacrifices into the bonfire . A Caun cleric would wear the flowing clothes associated with so many other priests, yet she does still wear armor for practicality's sake. The staff she is holding is a minor relic called the Walking Stick of Jul. Among other powers the Walking Stick will point the way to your destination. Next is the Halfling Druid. This guy is something special. This is based off of the character one of my friends, Matt, is playing in my current Pathfinder game set in the Chronicle world! If you're curious how my RPG Character Sketches look, here you go! I may have gotten the hair color wrong, but other than that I am so pleased with how this one turned out. The character's name is Traveler, he's a Reincarnated Druid from Ultimate Magic. He's been reincarnated a few times and has developed an eclectic assortment of gear. The two most notable items are the intelligent spear that looks like a Marlin and the intelligent scarf with various gaming boards knitted into it. Both of them talk to Traveler and each other and have their own little rivalry going. That's it for this week! Make sure to come back tomorrow for a new Chronicle strip and on Friday for the latest Fun Art Drawing! As always, Like and Share on the Social Media of your choice!